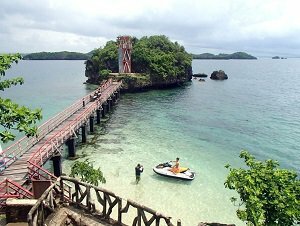 Created as a national park on 1940 during the term of the late president Manuel L. Quezon, the Hundred Islands in Alaminos, Pangasinan is truly a wonderful showcase of what the Philippines has to offer. 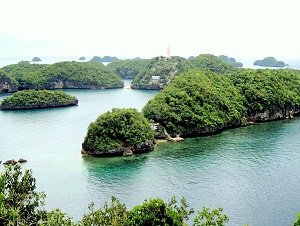 An Hundred Islands tour is popular because of its accessible distance from most cities in Luzon, scrumptious local food and friendly locals. The way the island facilities and activities were designed and created, you can say that having a pleasant family time at the islands was definitely top of mind. Whether you are traveling with lola or with bunso, you can be sure that they will both have something to do and enjoy. Those who prefer quiet moments can choose to swim and snorkel on the islands' clear waters, while those who are craving for some action can go parasailing or wall climbing. Naturalists will enjoy seeing endemic trees like the smelly bangar and migratory birds like terns, swiftlets and swallows. So whatever your travel goal may be, the TRIPinas will present you different options to have fun, perhaps a hundred different ways if you only let it. 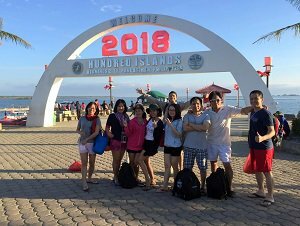 Our tour package is primarily tailored to suit the family and barkada but we can handle intimately sized groups as well. A private vehicle pick-up/drop-off can be done from Manila, Pampanga or Baguio (location to be arranged during registration process). TRIPinas will take care of your registration, boat and life vests during the boat ride. Your dedicated boatman will take you to the accessible islands on the national park and tell you what activities you should not miss. After a day of fun, fun, fun under the sun, it is time to fuel up. Trust us when we say that Pangasinan is a food haven, so go and have your fill of pigar-pigar (stir-fried beef and liver), Dagupan bangus and Alaminos longganisa, all available on popular local restaurants and at the public market and carienderia. When in doubt, follow the local crowd. Those who wish to satisfy their sweet tooth can head towards the stalls of puto Calasiao (rice cakes), tupig and binungey(glutinous rice mixed with coconut cream, cooked inside a bamboo). Our friendly driver can take you pasalubong-shopping so you can bring a piece (or two) of Pangasinan home with you. Rate for day-tour (for group of 10 people): Php1,450/person - Inquire now to know our promo rate. Keep in mind that the price depends on the number of people in your group. Duration: One full day. We can also organize an overnight. When: We suggest visiting the area from end of October to early June. Ready for the island hopping? Zip-line or Jet Ski or both? Our driver will pick you up at a pre-determined location and, after a thorough briefing, all will board your private vehicle to head to Alaminos, Pangasinan. Travel time from Metro Manila will be around five hours (from 1AM - 6AM) with a few toilet stops. You can have your breakfast at Alaminos town where there are more food options or at Lucap wharf (about 15 minutes away from the town) where you will have your first glance of what the park has to offer. Wherever you choose to chow, make sure that you eat just enough to power you for the morning but not too much as the waves can get rough sometimes and you don't want to end up feeling seasick. After breakfast, you will be given enough time to change to your beach clothes and re-pack your bags for the boat. Bring with you only what is necessary. Read our FAQs to know what to wear and pack for the island hopping. Don't forget to bring the garbage bags provided by the tourism office to manage your waste and avoid littering in the park. Once the boat is ready, don your individual life vests (mandatory) and brace yourself for some island splashin'! Quick note: Not all islands are open to the public. The boatman will take you to the ones that are accessible for tourists. The boatman will take you the major islands like Children's, Governor's and Quezon Island where you can frolic to your heart's content. Activities like riding the zip line or scaling the wall will surely give you an adrenaline rush. Wanna channel the little mermaid in you? Why not go snorkeling or helmet diving. But if you just want to chill, take photos and soak up the sun - go for it; promise, we won't judge. You will notice some local crab vendors offering their fresh catch for the day. They're easy to spot with their wide-brimmed hats and net full of crabs. They can cook the crabs for you (best steamed)) just in time for your lunch. And with all the energy you will spend with all the beach activities in the island, it will be a treat to have someone prepare your grub. 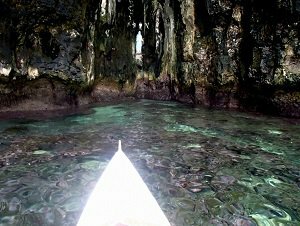 There are other minor islands that you can visit as long as the weather is good, the waves are friendly and you are still within the time. Be reminded that you have the service boat until 5:30PM only so manage your time well. After a long day, you will return to the wharf where you will surrender your garbage bags to the tourism office so you can get your garbage deposit back. There are also some pay shower facilities that you can use so you can clean yourself up before you head back to Manila. On your way return, don't forget to buy local food (Alaminos longanisa, Dagupan bangus, tupig) for home and as gifts to family and friends. Depending on the traffic situation, you will reach Metro Manila by 10PM, hopefully with a full stomach and a happy heart. Note: Should you wish to bring your own vehicle and/or start from a different location outside of Manila, just let us know when you send your inquiry and we’d be happy to customize the itinerary for you. What do we wear/pack for this adventure? For your convenience, we suggest that you wear: swimsuit + rash guard + beach shorts + hat. Avoid anything cotton - its' heavy and comfortable. It's better to wear reef shoes/aqua socks than flip flops as there are some slippery areas. The former has more traction and will protect you from slipping. To keep your gears dry, invest on a good dry bag (around 10-20L). Protect yourself from the sun's harmful UV rays by applying and re-applying sunscreen. Depending on the season, some areas may have some jellyfishes. Before heading to the water, check the sign on the coast to avoid untoward incidents. You can use sunscreens that have anti-jellyfish inhibitors on them if you must go to the water. Bring enough food and water with you. It is easy to get dehydrated and hungry when having fun under the sun. Pack them in re-usable containers to keep the garbage to a minimum. ❶ Where is the National Park? ? It's located at Alaminos, Pangasinan in Region I (Ilocos region). If using a private vehicle, it's about 5 hours away from Manila, a bit less if you are coming from Angeles, Pampanga or Tarlac. ❷ Does it really have 100 islands there? Actually, there are more! 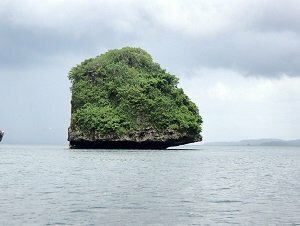 Depending on the tide, there are either 104 or 103 islands, according to the park officials. ❸ How safe is the trip? It's safe for families and groups of all ages. Whenever you're in the boat, you are required to wear a life vest. Activities like zip-line, wall climbing, helmet diving are supervised by trained park personnel. ❹ At the wharf, we were given trash bags by the park officers. What are they for? The city government of Alaminos launched on October 2017 the "Basura Mo, Iuwi Mo" Program which aims to promote responsible tourism. To ensure that no litter is left behind on the islands, guests are provided garbage bags which they can use to place all their rubbish during their tour. One bag is for biodegradable items and the other bag is for non-biodegradable. Visitors are expected to surrender the bags to the tourism office on their return. ❺ Is there phone network on the islands? There is phone connectivity at the wharf and on the islands. ❻ Can we have a bonfire? No, it is not allowed as it can cause forest fires and disturb the endemic flora and fauna in the area. ❼ Can we stay overnight at the islands? Some islands have facilities to accommodate guests who plan to stay overnight. Pre-booking is required.